This pack of baroque music is ideal to use a practice and performance pieces. The arrangements have been tried and tested for many years with great success, and are brought together here in one book to provide a big saving on the pieces compared to their full price. 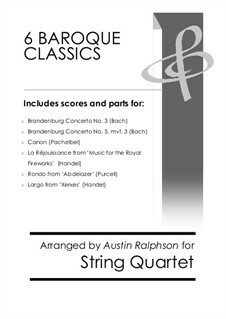 For string quartet bundle / book / pack Arranged by Ralphson A. For wind quintet bundle / book / pack Arranged by Ralphson A.